Bifurcated superficial temporal island flap (BSTIF) is an innovative flap for reconstructing both burned eyebrows and eyelids. In some patients, the eyebrow may need to be advanced medially in a second stage with the same limitation were observed in the lower flap to reconstruct the medial part of the lower eyelid. It is a new idea that reconstructs three different unique aesthetic facial units with one-stage island flap. Our case represents the use of the arterial extension for one-stage reconstruction of the most medial limits of the eyebrows and lower eyelid as an extended BSTIF. 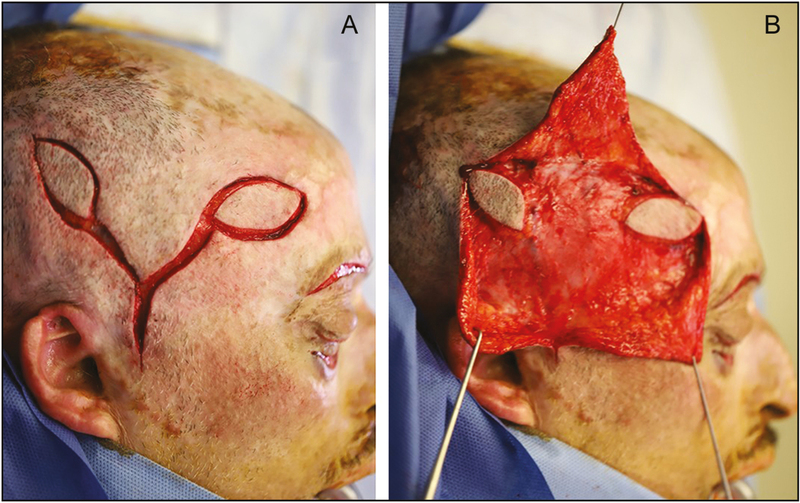 A 47-year-old man with severe thermal burn injury to the face, including bilateral periorbital regions, presented with bilateral upper and lower ectropion with loss of both eyebrows [Figure 1]A. Release and reconstruction were carried out with full-thickness skin grafts seven times. The patient presented in Saudi German Hospital Cairo, Cairo, Egypt, with same manifestations with a recurrence of contractures, severe bilateral epiphora, alopecia, and scarring of both eyebrows and left-side corneal opacity. The patient signed a full detailed informed consent, showing the steps of the surgery, anesthesia methods, and medical photography. Under general anesthesia, bilateral surgical marking of the superficial temporal artery and its frontal and parietal branches using intraoperative Doppler to reach the most terminal audible frontal branch or its anastomosis with the distal part of opposite branch was made, the same was carried out for the parietal branch [Figure 2]A. Release incision was designed for the eyebrow by following the ideal aesthetic brow concept described by Westmore and Ellenbogen for obtaining the normal vertical length of the upper eyelid. Next, the full release of the lower eyelid was obtained through a subciliary incision. The two skin islands were designed on each side, according to the defect size, [Figure 2]B and marked with an adequate arc of rotation on the axis of both arteries with their extensions outside the temporal region [Figure 3]A. The frontal flap, located anterior to the anterior hairline, measured 4×1.5cm on the right side and 4.5×1.5cm on the left side with half of the flap located in the frontal region and the other half in the parietal region. The parietal flap was hairy and located over the extension axis of the parietal branch and was designed according to the direction of the eyebrow hair, measuring 4.5×1.5cm on the right side and 5×2cm on the left side with two-third of the flap located in the parietal region and the other one-third in the temporal region. A preauricular skin incision began few millimeters in front of the tragus and extended upward following the marking of the superficial temporal artery (STA). Then a Y-shaped incision was made in the temporal region extending to the proximal edges of both skin islands, care should be taken to avoid injury to the main pedicle or its branches. Then, the borders of the skin islands were incised, with care to the hair follicles, especially in the parietal flap. we included a thin layer of subcutaneous tissue deeper to the hair follicles, the flap elevation was proceeded from distal to proximal with caution to avoid pedicle injury where it enters the flap, and the dissection was extended proximally to the level of the tragus again to avoid any skin tethering or limited arc of rotation of the flaps. [Figure 3]B. The two flaps were separated from distal to proximal direction under visualization through indirect transillumination up to the level of bifurcation of the STA [Figure 4]. 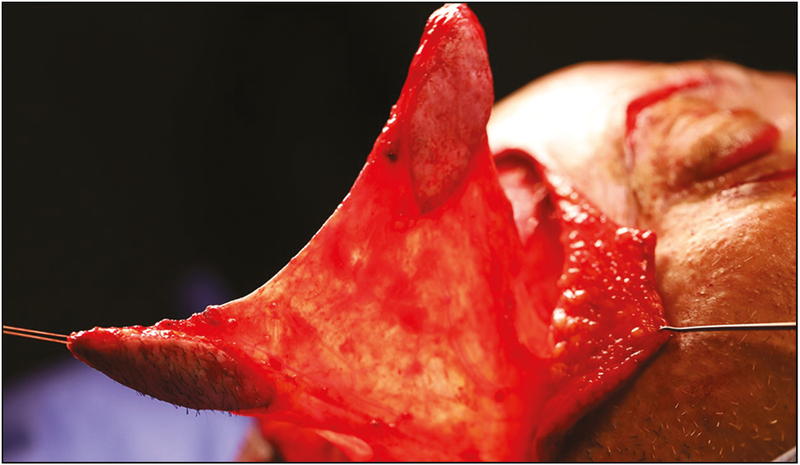 A proper subcutaneous tunneling between each flap and its recipient site was dissected; then, the flaps were transferred and sutured to the edges of the defective skin [Figure 5]. Little subgaleal dissection was made to help direct closure of the donor site without tension; suction drain also was inserted before closure [Figure 2]. Postoperative course was uneventful with no complications regarding the flaps and donor site. The parietal flap reached the most medial part according to Westmore and Ellenbogen criteria of the aesthetic eyebrow. The lower flap reached the most medial point of the palpebral fissure in the vertical plane with the complete resolution of epiphora after 12 months of follow-up [Figure 1]B. We administered a questionnaire to assess patient’s satisfaction regarding the density and orientation of hair, the symmetry with the other side, and the skin color match of the non-hairy flap. He was asked to complete the questionnaire and to provide a score of 1–4 according to his degree of satisfaction. The results of the questionnaire are summarized in [Table 1]. Periorbital burns can result in excessive cicatricial scarring and distortion of skin and soft tissues around the eye with functional impairment and deformities, including alopecia in the eyebrows, ectropion in both upper and lower eyelids, scleral show, corneal ulcerations, and epiphora. Eyebrow alopecia with extensive scarring following periorbital burns makes its reconstruction challenging, with limited success rates of micrografting and hair-bearing full thickness skin graft (FTSG).,Also, postburn ectropion of eyelids is associated with a high rate of recurrence following release with FTSG and limited local facial flaps, especially in extensive facial burns. BSTIF is considered a good standard flap that could reconstruct three different aesthetic facial units by one-stage island flap; for eyebrows, it is typically matched with regard to the density of hair and its direction, especially for male eyebrow, and needs other procedure for thinning of the flap for female eyebrow. For eyelids, BSTIF is considered the excellent option for reconstruction with hidden scars. The frontal flap could be hairy or non-hairy according to the course of the frontal branch of STA in relation to the anterior hairline, if the flap is hairy, laser hair ablation can be performed later. But still there are limitations for BSTIF as it is difficult to reach the most medial part of eyebrow and lower eyelids, as the normal eyebrow begins on the same vertical plane of the lateral extent of the nasal ala and medial canthus, with caudal hair of this medial part should be 1cm above the caudal extension of the supraorbital rim, which is determined by palpation. These limitations of the original BSTIF may need later procedures to be advanced medially. Many articles in the literature described the extension of the parietal and frontal branches of the STA, especially by Pinar and Govsa, which reported detailed surgical anatomy of STA and its branches. They described that the parietal branch is considered the direct continuation of STA and extends posteriorly till the most posterior part of parietal region and anastomose with the opposite parietal branch, with many subbranches extending more posteriorly with anastomosis with postauricular and occipital arteries. They also described that the frontal branch extends anteriorly till anastomosis with the opposite frontal branch with many subbranches communicating with the supraorbital and supratrochlear arteries. On the basis of the principles of the extension of the branches of STA, an extended BSTIF can be used, guided by intraoperative Doppler, which enabled us to reach and reconstruct the most medial parts of eyebrows and upper and lower eyelids without the need of any secondary procedures. However, extended BSTIF is limited in cases of temporoparietal or posterior scalp scarring and/or the previous use of temporoparietal fascia flap. Another limitation is that, in cases of early anastomosis of the STA branches indicated by non-audible distal extension, we cannot guarantee the survival of the extension, especially in such small-sized flaps. Extended BSTIF can overcome the limitation of the original one to reconstruct the most medial aesthetic points of the eyebrow, and epiphora also can be resolved completely by reconstruction of the most medial part of the lower eyelid ectropion. Elbanoby TM, Elbatawy AM, Aly GM, Ayad W, Helmy Y, Helmy E, et al. 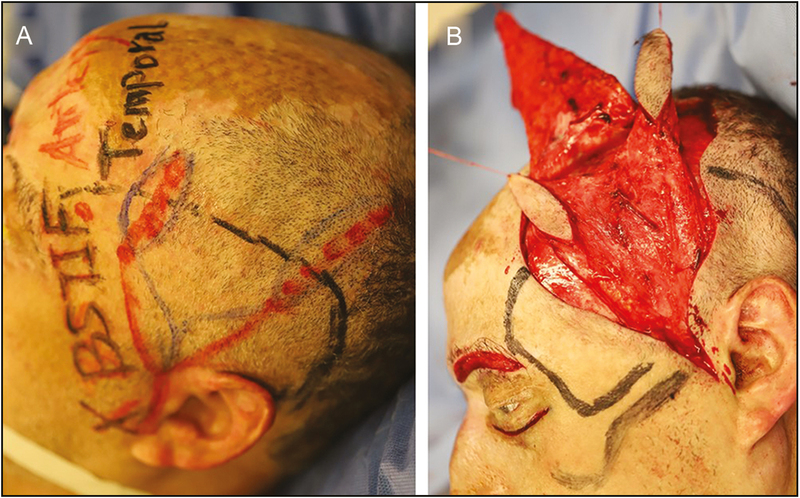 Bifurcated superficial temporal artery island flap for the reconstruction of a periorbital burn: an innovation. Plast Reconstr Surg 2016;4:e748. Pinar YA, Govsa F. Anatomy of the superficial temporal artery and its branches: its importance for surgery. Surg Radiol Anat 2006;28:248-53. Abul-Hassan HS, von Drasek Ascher G, Acland RD. Surgical anatomy and blood supply of the fascial layers of the temporal region. Plast Reconstr Surg 1986;77:17-28. Westmore MG. Facial cosmetics in conjunction with surgery. Course presented at the aesthetic plastic surgical society meeting, Vancouver, British Columbia, May 1975. Ellenbogen R. Transcoronal eyebrow lift with concomitant upper blepharoplasty. Plast Reconstr Surg 1983;71:471-90. Wang J, Fan J. Aesthetic eyebrow reconstruction by using follicular-unit hair grafting technique. Chin J Plast Surg 2002;18:101-3. Wang J, Fan J. Cicatricial eyebrow reconstruction with a dense-packing one- to two-hair grafting technique. Plast Reconstr Surg 2004;114:1420-6. Elbanoby TM, Zidan SM, Elbatawy AM, Aly GM, Sholkamy K. Superficial temporal artery flap for reconstruction of complex facial defects: a new algorithm. Arch Plast Surg 2018;45:118-27. Kajikawa A, Ueda K. Bilateral eyebrow reconstruction using a unilateral extended superficial temporal artery flap. Ann Plast Surg 2003;50:416-9.